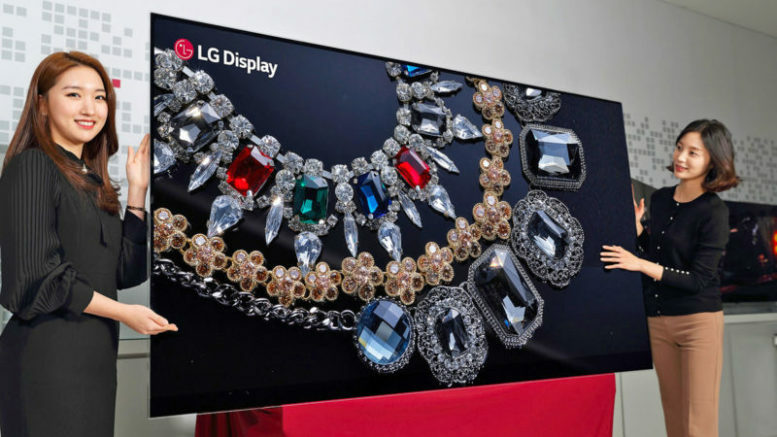 What you see above is LG’s 88″ prototype 8K TV. Other sites are already talking about how it’s going to be shown at CES, and that it won’t be the other nearly-production-ready 8K TV. And folks, I’m just not ready to do this. At some point we will all have 100″ 8K televisions. This is just obvious. Back in the 1990s we all got 32″ tube TVs, in the 2000s we got 42″ flat TVs, and finally in the back half of the 2010s we’re getting 60″ 4K TVs. It’s great that we’re paying less and less while we’re getting more and more. So I’m sure the trend will continue and we’ll have 8K TVs that are big enough to take up an entire wall, and there will be something new and interesting to do with them, I’m sure. But in the short term 8K TVs are a distraction and they’re an enabler to the tech press who still look at CES as a TV showcase. So believe it or not, I’m not only uninterested, I’m against the idea. Sure I’ll walk past it but I’m sure I won’t be able to tell the difference between 4K and 8K at that size. Why does this irk me? First of all there just isn’t enough 4K content today to even start to worry about 8K. I hope we’ll see some real increases in 4K content availability this year. Sinclair-owned TV stations will start test broadcasts of 4K signals (although it’s not clear if they’ll actually have 4K programs or just upscaled HD.) Streamers like Netflix and Amazon keep piling on “4K” and as more people upgrade their internet, it’s likely they’ll be able to get to the sustained 25Mbps transfers they’ll need to watch 4K content. DIRECTV plans on adding any 4K channels that come along, if any come along. So maybe things will look a lot rosier by the beginning of next year for 4K, but as of today it’s still slim pickings. I think everyone really needs to keep the focus on 4K before looking out on the horizon at 8K. Second of all 8K is pretty ridiculous. Using today’s standards as a guide, DIRECTV would need to launch 4-6 new satellites to convert the majority of their content to 8K, even if 8K content existed which it doesn’t. If you wanted to stream 8K using today’s tech you’d need sustained speeds of 100Mbps, which means more like peak speeds of 400Mbps. 8K would probably only make a difference at the 100″ size or greater. These are numbers that are just plain unachievable here in 2018. Five years from now they may make more sense. I get it, LG and others want you to see they’re ahead of the curve but how much further ahead do you need to be when we still haven’t really adopted 4K HDR yet? But that’s really not my objection. Personally I think CES has a branding problem. The show was reasonably unknown to average folks until the 1990s when it became famous for giant TVs (giant at the time meant a 60″ rear projection rig.) For the last 20 years, CES has been largely synonymous with TVs, and every time I go I’m asked, “did you see the big TVs?” Yes, I saw the big TVs. And I saw a lot of other things that interest me a lot more than big TVs. In the meantime, a big TV has gone from being a luxury item to something that average folks throw in the cart at Costco. It’s just not something to drool over anymore. I think the press and the CES people are enabling each other by putting so much focus on big TVs, especially when “big TV” doesn’t even mean “premium TV.” The biggest booths at CES the last two years have belonged to discount brands like TCL and Haier which make TVs you find at low-end discount stores. They’re fine TVs, but they’re not luxury items. So by tying their destiny to the “big TV,” the CES people are driving themselves downmarket. They’re ensuring their own downfall in the eyes of the public by only focusing on that one little sliver of what you see at the show. And let me tell you there are probably 100,000 other things at CES, from wearables to cars. There are big and small manufacturers spread out over miles of exhibit space and maybe 25 of them total are all about TVs. The rest are about drones or accessories, or installation stuff or just about anything you can think of. These other manufacturers don’t get a lot of media coverage even when they deserve it, because everyone wants to talk about the big TVs. And probably most of all, this obsession with big TVs that you won’t even care about for a decade makes it hard to do actual business at CES. I’ve been going to the show for over a decade and every year I spend more and more of my time in little rooms talking business. I talk about products we’ll be rolling out in the next six months and not about pipe dreams like 8K TVs. CES is really a business-to-business show despite what you see in the flashy puff pieces and the most important part of the show looks like row after row of identical booths with identical people. That’s where the really cool stuff is if you can find it. So yeah, there will be 8K TVs at CES. I’ll post a picture of them if I get a chance. But that’s not what you should really be excited about.